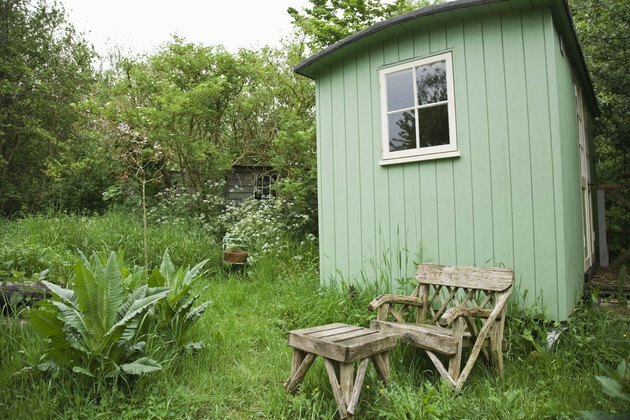 Backyard sheds not only help you organize gardening equipment they also provide protection from the weather. Mowers, pruning tools and weed trimmers can easily rust when rain seeps into floors. Provide protection for your shed floor from floods and rain. Monitor your shed floor when it rains to see if there is any water build up. Check out all your lawn equipment to ensure that it is not showing signs of rust or other weathering. Repair the floors to keep your tools organized and ready to use. Remove everything on the floor of your shed. Sweep the floor, so you can get a good look at the damage. Feel each plank of the floor to see if it feels mushy or rotted. Place a leveler on each plank to make sure there is not slope. Sloping floors generally require foundation leveling. Use a claw hammer or a small ply to remove the nails of rotted wood or sloping wood. Fill the foundation with dirt for wood that is uneven with the rest of the floor. If the slope is drastically different, you can place bricks or gravel underneath the foundation. Measure the wood that you've removed to know how much cut. Cut the new pressure treated wood and lay down on the floor. Nail the wood in with galvanized nails. Paint the wood floor with wood preserver. Wait for one coat to dry before applying the second coat. Make sure there is at least three coats of wood preserver.